At 212 miles or 341km, the Southern Upland Way is Scotland's longest official Long Distance Path. Southern Scotland is all too often overlooked by visitors simply seeing it as an area needing to be crossed in order to get from the Scottish Border to the "interesting" parts of the country. Anyone walking all, or even some, of the Southern Upland Way will realise that this too often overlooked part of the country offers plenty of variety, interest and challenge in its own right. And it is worth holding onto that word "challenge" for a moment. Given the widespread lack of knowledge about southern Scotland, it comes as a surprise to most people to find that the Southern Upland Way is Scotland's most challenging Long Distance Path. In part this is because it passes through some of the the least inhabited and most remote areas of countryside in the United Kingdom; in part it is because it cuts across the grain of the country, involving a series of climbs and descents and a highest point of 725m or 2,378ft; and in part it is because the lengths of individual stages can be very long, up to 27 miles or possibly longer, depending on how you divide the walk. All of this makes the normal warnings about fitness and equipment levels, and need to be able to read a map and use a compass, especially important. The Southern Upland Way itself is well waymarked. But if you stray from it - always a possibility, especially on upland stretches in poor visibility - you are likely to find yourself, literally, on your own, without any signposting, and possibly a very long way from help. Oh, and quite possibly without a mobile phone signal as well, so "phoning a friend" is often not an option. 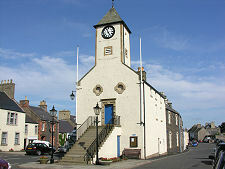 The Way extends for 212 miles from Portpatrick in the far south west of the country to Cockburnspath, where the Lammermuir Hills meet the North Sea. It is normally walked from south west to north east. This places your back to the prevailing wind and weather, and, more optimistically, it means you are looking away from the sun more than you are looking into it, making walking more comfortable and allowing you to see the countryside at its best. The side column gives links to useful resources. 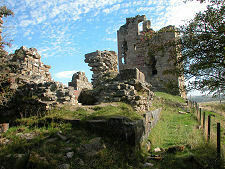 The route description below is broken into nine main sections: each of which contains links to further information on Undiscovered Scotland. The Area Pages provide links to accommodation providers and other businesses. 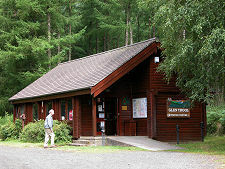 The Feature Pages each contain detailed background information and a collection of images about particular places or attractions on the Southern Upland Way or near it. Accommodation is quite scarce along some stretches of the Way, so booking in advance is recommended (though this does give the downside of removing any flexibility over timing of sections or the introduction of rest days). Note that this page does not set out to provide you with the full range of detailed information you need to walk the Way, but it should give you a good starting point. And when used with the rest of Undiscovered Scotland it will give you an idea of what the Southern Upland Way and the places you will be passing through are like. Note too, that even allowing 13 days for the crossing leaves you with four stages of 20 miles or more, including one of 27 miles. The only practicable ways of shortening section lengths are to camp wild en route; to leave cars at strategic points along the route; to use public transport or hitch-hike to get to larger villages and towns (then back again); or to use one of a number of companies that provide luggage carrying and backup services on the Southern Upland Way or provide guided walks along it. 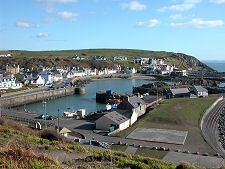 The starting point for the Southern Upland Way is at the north west end of the pretty harbour at Portpatrick. From here it climbs north west to the top of cliffs before making its way to the lighthouse at Black Head. It then heads inland, crossing the Rhins of Galloway before skirting round to the south of Stranraer while never actually coming within a mile of the largest town in the area. 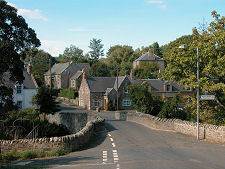 The Way eventually meets the busy A75 at the small village of Castle Kennedy, the end of this first section. Accommodation in the area can be found via our Dumfries & Galloway main page. 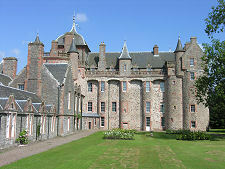 Some accommodation is available in Castle Kennedy, but as it is only three miles from Stranraer, the possibility also arises of using public transport or hitch-hiking to get into Stranraer for the first night, before returning the following morning. Information about public transport in Scotland, including an online journey planner can be found on Traveline Scotland. Those who have arranged an early start from Portpatrick and are fit can also consider combining Sections 1 and 2, though this would make a very demanding first day's walk. From the village of Castle Kennedy the Way passes through the grounds of Castle Kennedy itself, and many will want to take in the gardens here as part of their experience of South West Scotland. Further on a mixture of minor roads and tracks lead you to a minor road a little over a mile south of New Luce, a small village with a number of facilities of interest to the walker. The Way does not actually go through the village, instead staying south and east of it: but many walkers on the way end up there anyway. Accommodation in the area can be found via our Dumfries & Galloway main page. Starting Section 3 in New Luce, walkers face something of a moral dilemma. They can rejoin the Way at the point they left it south of the village, but this involves walking round three sides of a fairly large rectangle and considerable distance can be saved by walking along a minor road east from New Luce to join the route of the Way. The downside of this is that you have not actually walked the full course of the Way. More minor roads, plus moorland and forest tracks, bring you eventually to Bargrennan on the A714 twelve miles north of Newton Stewart. Accommodation in the immediate area is available but limited and those walking the Way come face to face with a theme that will recur through much of the walk. Do you try to stay at the place where the section of the Way ends, or do you use your initiative in terms of organised transport, public transport (to the extent available), or hitch-hiking to extend the choice of accommodation? The Southern Upland Way really is a walk that demands a lot in the way of advanced planning. 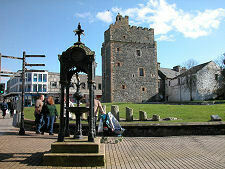 Accommodation in the area can be found via our Dumfries & Galloway main page. On Section 4 you really begin to see the wilder side of Southern Scotland. The route leads along Glen Trool and past the south side of Loch Trool before crossing a pass at nearly 900ft and descendng through one of the Way's longer forested sections to Clatteringshaws Loch. It then climbs to over 1000ft on Shield Rigg before returning to minor roads and tracks as it makes its way to one of the gems of the walk, St John's Town of Dalry. 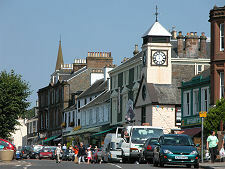 Accommodation in and around St John's Town of Dalry can be found via our Dumfries & Galloway main page. Anyone looking for ways of shortening this section has few options. In 24 miles of walking you see barely a handful of cottages, and only once do you come within 2 miles of an "A" or "B" road between the start an end points of the section. If Section 4 was challenging, Section 5 is still more so. The 27 miles to Sanquhar offers very little in the way of obvious break points and includes your first real high level walking, taking in Ben Brack at nearly 1900ft as the Way crosses the wild and complex countryside along the south side of the Carsphairn Forest. Take a wrong turning or lose the path here, and you could easily add many miles to your walk. The day's end is at Sanquhar, in Nithsdale, home to Britain's oldest Post Office, and to a strong contender for the title of Scotland's saddest castle. Accommodation in and around Sanquhar can be found via our Dumfries & Galloway main page. Section 6 is very short, but will probably come as a relief after two long sections (and before two more). 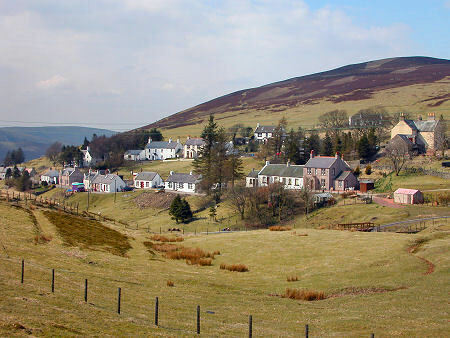 An increasingly upland walk takes you high into the Lowther Hills to Wanlockhead, a village that developed around its lead mines and lays claim, perhaps surprisingly, to the title of Scotland's highest village, at 1531ft (467m) above sea level. Accommodation in and around Wanlockhead and the nearby village of Leadhills can be found via our Dumfries & Galloway and Glasgow & Clyde Valley main pages. From Wanlockhead the Way climbs to its highest point on the summit of Lowther Hill, at 2,378ft (725m). It then heads steadily south east across moorland and hills and through forests, crossing another very lonely chunk of Southern Scotland before coming within sight and sound of the M74 motorway, which it crosses near the north end of the village of Beattock. Beattock is technically the end of this section, and from here the Way heads east. But most people walking the way will make their way the extra mile and a half north east into Moffat, the approximate mid point of the Southern Upland Way and one of the largest settlements on or close to the line of the walk. 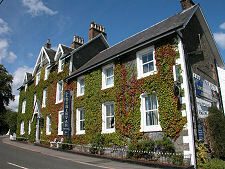 Accommodation in and around Moffat can be found via our Scottish Borders main page. If you start Section 8 in Moffat, you have to face another moral dilemma. Do you return to Beattock to pick up the line of the Way where you left it, or do you take a more direct route that leaves a gap on the line of the Way itself? Whatever you do, you end up heading east then north east into the wilds of the Eskdalemuir Forest and another very lonely stretch of the Way that passes very little habitation en route. You emerge on the A708 at St Mary's Loch. Accommodation used to be available here, at the famous Tibbie Shiel's Inn, but this has now closed. It takes only a brief look at a map to realise that at this point you are only a 15 mile bus ride (or hitch-hike) to Moffat, with its considerably wider range of facilities. 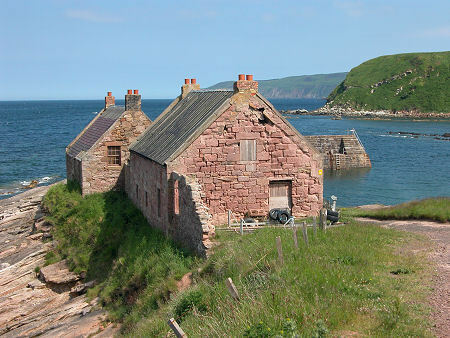 Accommodation in and around the area can be found via our Scottish Borders main page. Section 9 is another (probably very welcome) short day. 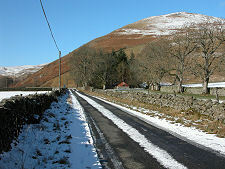 A largely upland trek brings you out in the hamlet of Traquair, a little under a mile and a half south of Innerleithen. In the interests of topping up supplies and ensuring they have somewhere to stay, many walkers do make their way into Innerleithen and spend the night there. En route they will pass the end of the drive for Traquair House, the oldest continuously inhabited house in Scotland. 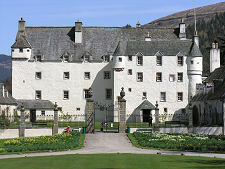 Accommodation in and around Innerleithen can be found via our Scottish Borders main page. Having made your way back to Traquair, you follow the Way over another long stretch of upland and forest walking before it descends to cross the River Tweed at Fairnilee, then takes an upland route around the shoulder of Gala Hill to the edge of Galashiels. It then skirts the River Tweed for a while, on the opposite side to Sir Walter Scott's home at Abbotsford, then crosses to the south bank to make its way into Melrose. 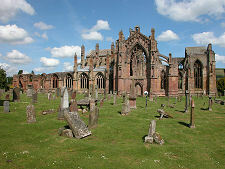 In many eyes this is the most beautiful of the border towns, and however far you've walked, you'll find it hard to resist the draw of the ruins of Melrose Abbey once you've settled into your accommodation. 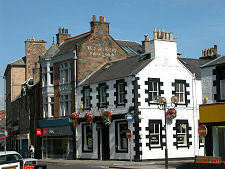 Accommodation in and around Melrose can be found via our Scottish Borders main page. Section 11 takes you across the River Tweed at Melrose and briefly west along its north bank before striking out north, a direction the Way continues to follow to Lauder after a mixed route of tracks, paths and minor roads. Lauder is as fascinating as Melrose is beautiful, and once more you should make allowances for local exploration once settled. 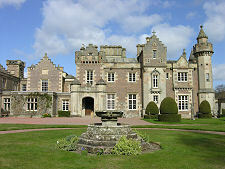 And while Melrose was formed and shaped by the influence of its abbey, Lauder was formed and shaped under the influence of nearby Thirlestane Castle, a magnificent castle that has over the centuries grown into a stately home. 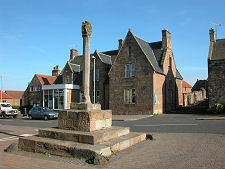 Accommodation in and around Lauder can be found via our Scottish Borders main page. From Lauder the Southern Upland Way heads out north east across the Lammermuir Hills, though not before taking an excursion through the grounds of Thirlestane Castle. We've described a number of sections of the Way as lonely or remote, but in many ways Section 12 is the most remote of them all. For much of its way the route follows tracks and paths over the Lammermuirs, and only once between its leaving Lauder and its approach to the hamlet of Longformacus does it pass within a mile of even the most minor of roads. Longformacus itself has limited accommodation on offer, but because it lies on minor roads itself, getting to accommodation in the wider area can be more difficult than elsewhere on the Way. Accommodation in the area can be found via our Scottish Borders main page. After leaving Longformacus you head north east, as you have for most of the route of the Way. After following the course of the Whiteadder Water for some distance, you cross it at Abbey St Bathans, near a historic church and over a bridge whose heavily-engineered construction suggests that the river can turn violent on occasion. A little further on the Way crosses the lines of the A1 Trunk Road and the East Coast Main Line Railway before approaching the North Sea coast through Penmanshiel Wood. From Pease Bay and its holdiay park, you follow the top of the cliffs north west to find yourself looking down on one of Scotland's hidden gems, the small harbour at Cove. Walking down the quarter-mile track to the harbour here after trekking nearly 212 miles across Scotland may seem like an unwelcome diversion, but this place really is too good to miss. From Cove the Southern Upland Way reverses the course it has followed fairly consistently until now, and heads south west for a little under a mile to its end at Cockburnspath. This can seem like a very odd place for the Way to end, but it does at least ensure that those who have covered the 212 miles have to walk no further if they want to catch a bus as the first step in their journey home. Contacts, Western Section: Dumfries and Galloway Council Ranger Service, Militia House, Dumfries DG1. 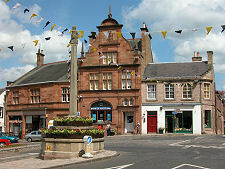 Contacts, Eastern Section: Scottish Borders Council, Access and Countryside, Council HQ, Newtown St Boswells TD6 0SA. Maps: The Ordnance Survey 1:50,000 maps of the areas crossed by the Southern Upland Way Way are Landranger maps 82, 76, 77, 78, 79, 73, 74 and 67.